Spotify and Pandora artist payments: Not as exploitative as they’re made out to be. 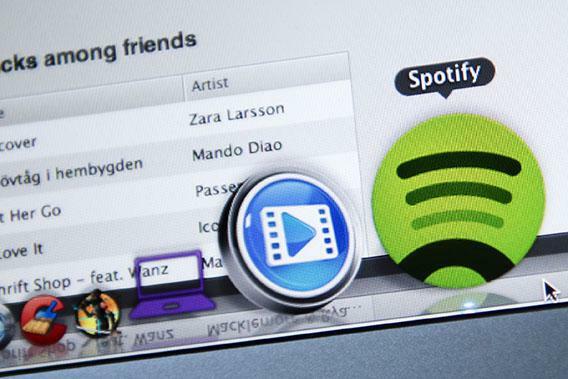 How Ashamed Should You Feel About Using Spotify? Music-streaming services really don’t exploit performers. Songwriters, though—that’s another story. Spotify lets you choose exactly what you want to hear from a near-infinite jukebox, but should you feel guilty for using it? In June, David Lowery, singer-guitarist of Cracker and Camper Van Beethoven, posted part of a royalty statement to his blog The Trichordist. Cracker’s song “Low,” he revealed, had been played 1,159,000 times on Pandora in three months; Lowery, in his capacity as the song’s co-composer, was paid $16.89. For 116,280 plays on Spotify, Lowery got $12.05. Meanwhile, “Low” racked up only 18,797 plays on AM and FM radio stations during the same quarter. But for far fewer spins, Lowery received far more money: $1,373.78, to be exact. Maybe. Or maybe it’s not quite as simples as that. The image of wide-eyed young musicians having their lunches eaten by rapacious corporations is pretty compelling, and the ongoing collapse of the record business makes it look even scarier. The week ending July 28 had the lowest total album sales documented since Billboard started using Soundscan to track sales in 1991. But it’s also worth considering who’s paying whom when music gets streamed, and how that might change. Whenever you read a shockingly low number and worry about the fate of your favorite band, it’s worth keeping three things in mind. 1) “The music business” is not the same thing as “the recorded music business”—especially for musicians. A recent survey by the Future of Music Coalition found that, on average, 6 percent of musicians’ income comes from sound recordings. That’s not an insignificant amount, but it’s also a lot less than what nonmusicians might guess. (And, although there isn’t reliable data from the pre-Napster era, anecdotal evidence suggests that the percentage has never been much higher.) Recordings are how listeners generally spend the most time experiencing music, but not how we spend the most money experiencing music. In practice, recordings mostly serve as promotion for the other ways musicians make money: performing, most of all, but also salaries for playing in orchestras and other groups, session work, and so on. 2) Streaming music is not the digital equivalent of radio. For the most part, each time a song is played on ad-supported Pandora or subscription-based Spotify, it reaches one person. Each time a song is played on the radio, it can reach thousands of people—but when you turn on a radio station, you don’t know what you’re going to hear. Musicians expand their audience when new listeners stumble upon their work, which is why getting airplay is so important to them. Neither Pandora nor Spotify currently has anywhere near as many listeners as AM and FM radio—another reason it makes sense for them to pay less—but they also don’t present the same kind of opportunities for discovering new music. Pandora lets you pick particular artists you like, so you’ll hear them more often (although you might also discover similar artists you don’t know already). Spotify lets you choose exactly what you want to hear from a near-infinite jukebox (although it has a “radio” setting, too). Meanwhile, iTunes Radio has appeared on the horizon. Likewise, Pandora has taken pains to note that heavily streamed artists can make plenty of money through their service. Last October, co-founder Tim Westergren blogged that the company pays upward of $10,000 a year apiece for playing recordings by more than 2,000 artists. That’s not saying that the artists will see that much money, naturally, since the rights-holders are the ones who get paid; for a label, though, $10,000 is like selling 1,000 CDs. But then there’s the question of publishing, which is what’s bugging Lowery—the way songwriters get paid. Performers benefit from having their recordings played that aren’t directly monetary: glory, promotion, name recognition. Songwriters generally don’t, so they get a rate determined by law when their work is purchased or played. Though middlemen such as performance rights agencies and publishing companies take their cut, somebody like Lowery can still see a significant trickle of money from co-writing a minor hit 20 years ago. There are plenty of high-profile holdouts whose music isn’t on Spotify: AC/DC, Tool, Garth Brooks, Led Zeppelin, the Beatles—all artists for whom Spotify arguably can’t do much good anyway. Nobody’s going to hear the Beatles’ music for the first time and fall in love with it by stumbling onto somebody’s Spotify playlist, and Led Zep doesn’t need to convince young music fans to come see them play live. But the rates Spotify pays to the kind of big names that attract subscribers are often much higher, as Sasha Frere-Jones notes. That might well be the case. If we’re getting into hypotheticals, though, how many of those listeners might have bought the album, or come to one of Duckworth’s shows, because they heard the stream and were impressed by what they heard? And how does that compare to what would have happened if one of Duckworth’s songs had been broadcast once on the radio and heard by 4,685 people? More broadly, when does it make financial sense for musicians to restrict access to their recordings, and when is it simply a matter of asserting more control over their art? There’s no way to know the answers to those questions, but Nigel Godrich’s explanation that pulling Atoms for Peace’s recordings from Spotify was “about standing up for other artists’ rights” doesn’t entirely hold water. For less-than-famous performers, recording royalties have never been a way to get rich, or even to make a living; they’re a way to build up enough of a reputation to make a living through other means, and maybe accrue a little bit of cash. It’s songwriters—whether or not they’re performers too—who need to be wary about what’s going to happen as radio and recording sales gradually give way to streaming.